In all my years of tramping through Wisconsin’s forests, this is the first set of prairie trillium I have seen. 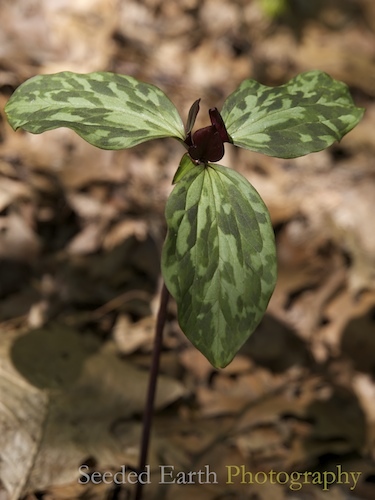 I could not find this particular species of trillium in any ID book, except for the local book Spring Woodland Wildflowers of the University of Wisconsin Madison Arboretum by Andrew L. Hipp. A rather thin book, with a narrow focus, but of great value when checking out the lesser known flowers in this particular arboretum. The prairie trillium, also called the red trillium (trillium recurvatum). Most often found in forests, but can be seen in savannas and prairies. This trillium was found in the Arboretum, though Madison is at its extreme northern limit. Also seen in southern and southeastern Wisconsin. It is on Wisconsin’s list for species of special concern. Here is a photo of the entire plant. Gives a better perspective. I found a group of seven plants all huddled together, but none anywhere else in the woods. Not to be confused with the purple trillium (trillium erectum) which grows in nearby Illinois, but not in Wisconsin. It is distinguished from prairie trillium by its flowers which are stalked and nodding. It also has leaves which do not bend backwards like the prairie trillium, but are held erect. 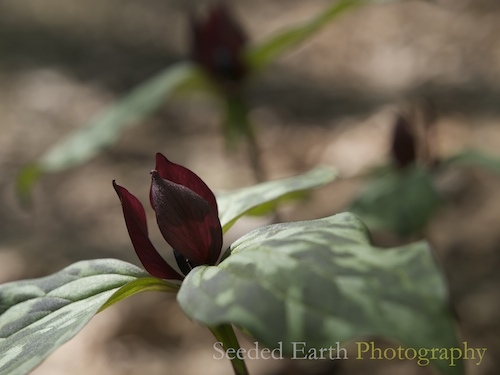 Your photos make me want to re-check my trillium photos. I guess I need to compare “nodding or not nodding” heads! Love Trilliums, Bo. I’m hoping to catch some more when we head to Maine in a week. Very nicely captured! Beautiful capture. Trillium are among my favorites.